تهدف هذه الدراسة لتحديد معدل انتشار تسوس الأسنان وحدته وتطوره في مجموعات مختلفة من المجتمعات السعودية. وقد تم استخلاص المعلومات لهذه الدراسة باستخدام عدة مصادر كــ PubMed وMedline وGoogle Scholar والمجلات السعودية الطبية للحصول على الأوراق العلمية عن تسوس الأسنان في المملكة العربية السعودية. خلصت الدراسة إلى أن انتشار تسوس الأسنان وحدته كان الأعلى بين الأطفال والبالغين وكبار السن ، ووضح تعاقب الأجيال زيادة ملحوظة في معدلات انتشار تسوس الأسنان خلال العقود القليلة الماضية بالمملكة العربية السعودية. Dental caries, though preventable, is the most prevalent oral condition which can detrimentally affect different demographic groups, and can have huge public health impact on the oral and systemic health, social well-being, income of individuals and health care systems. Nonetheless, there appears no evidence based policy decisions to reduce the prevalence of dental caries and minimize the resulting social and health care costs in the country. Most of the research and published reviews are about the prevalence of caries among preschool and school children. For instance, a recent review on dental caries from different administrative regions of Saudi Arabia was also about caries prevalence and severity in children. To the best of my knowledge, no review is available regarding the prevalence of dental caries among children, adolescents, adults and older individuals in Saudi Arabia. The objective of this review is to report the prevalence, severity and progression of dental caries in different age groups of Saudi communities possibly from all walks of life and from all administrative regions of the country. This review, therefore, can help dental and other health care providers, public health managers, policy makers, and other stakeholders to better benefit the individuals and communities in preventing and controlling dental caries. This can also enhance further research on dental caries and related factors in different target populations from different geographical areas of KSA. Observational studies including cross-sectional, retrospective, and longitudinal studies conducted on different age groups from different regions of Saudi Arabia were considered. The initial selection of the published papers included the reading of their titles and abstracts, and then selected articles were read to obtain the sample data of the present review. The author systematically searched different digital databases such as PubMed, Medline, Google scholar, World Health Organization (WHO) website, Saudi Dental Journal, and Saudi Medical Journal to retrieve the published articles and reports on dental caries in Saudi Arabia. Search was performed up to the March 2013. Search strategy included key words such as "dental caries" or "caries," dental decay or decay, decayed missing filled teeth (dmft) and DMFT, oral health behaviors/practices, oral health status, and fluorosis in Saudi Arabia. The lists of the references from the selected articles were checked, and relevant additional journal papers were picked to be included in the review. The manual search included the articles available at the library of the University of Dammam. Some of the articles were obtained by personally contacting their authors through E-mails. 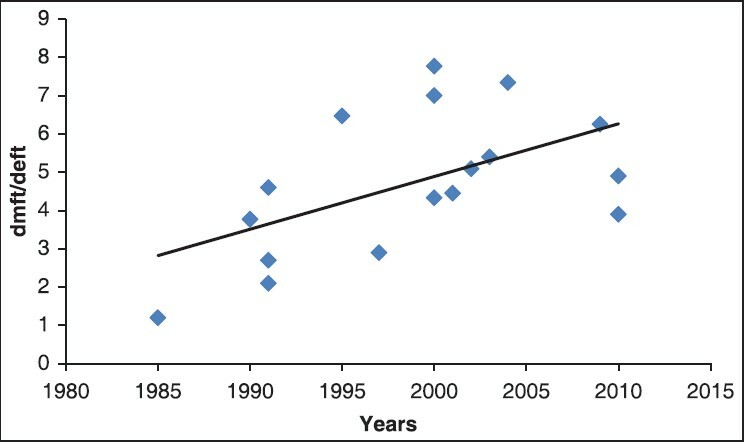 The search yielded the selected articles from 1982 to 2012, which particularly helped to estimate the secular trends in dental caries over a period of three decades in different age groups of the population. Inclusion criteria were established to include epidemiological studies conducted on children, adolescents, adults and elderly from all administrative regions to comprehensively report dental caries in different demographic groups in Saudi Arabia. The search included the articles published up to 2013. Observational population-based studies on prevalence, incidence and severity of caries were included in the review; hence, clinical trials were excluded. The research papers on the oral health practices and behaviors, enamel abnormalities, fluorosis, water fluoridation and oral treatment needs were included because some of them also reported caries prevalence or dmft/DMFT. The community based, school based, clinical and institutional based research articles on dental caries were included. Therefore, the studies conducted on children whether attending public, private or military schools, clinic or hospital, and adults and older individuals visiting primary, secondary or tertiary health care facilities were included in the review. Caries research conducted on special needs children was also the part of the present review. World Health Organization recommendations were mainly used to report the prevalence of dental caries in different age groups, thus studies on ages or age groups of 5 years (5-7 years) for the primary dentition, and 12, 15, 35-44 and 65-74 years of ages or age groups for permanent dentition were analyzed. The review includes15 studies on children aged 3-7 years, nine studies on children between 12 and 19 years, five studies on special needs children, seven studies on adults, and two studies on the older individuals. Data obtained from 38 study samples was analyzed to report the prevalence, dmft/DMFT, incidence and secular trends of dental caries among different target groups exposed to different social and cultural settings in various parts of the Kingdom. The prevalence and dmft or DMFT estimates were extracted from the selected studies and were plotted against the years in which studies were conducted to determine secular trends. Some of the studies were conducted on children with an age range of 2 to 18 years. therefore, appropriate sample size, and scores of prevalence and dmft/DMFT of children ages 3-7 years and 12-19 were extracted from the selected studies to follow the WHO guidelines as closely as possible. The prevalence, severity and secular trends among children will be discussed under the headings of primary dentition of children aged 3-7 years, permanent dentitions of children aged 12-19 years, and special needs children. 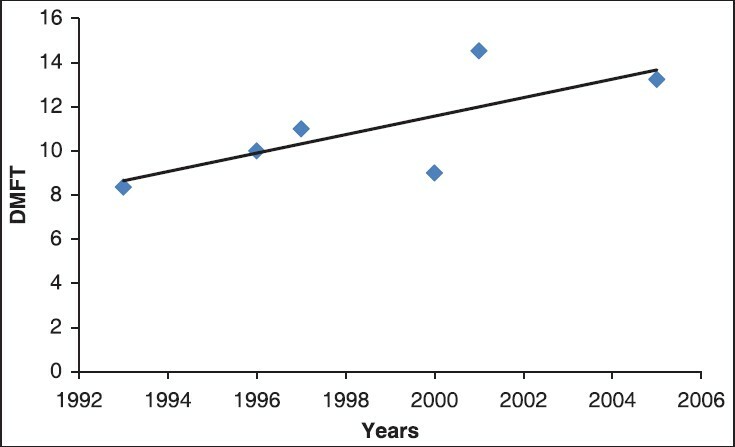 [Figure 1] and [Figure 2] show secular trends of dmft/deft estimates and the prevalence rates, and it can be observed that over the last three decades there has been a tremendous increase in the prevalence and severity of dental caries in children (3-7 years) in KSA. In 1982, Younes and El-Angbawi reported caries prevalence of 77.65% and DMFT of 2.90 in Riyadh. After a decade, Akpata et al. found caries prevalence of 76.5% and DMFT score of 2.10 in Riyadh. 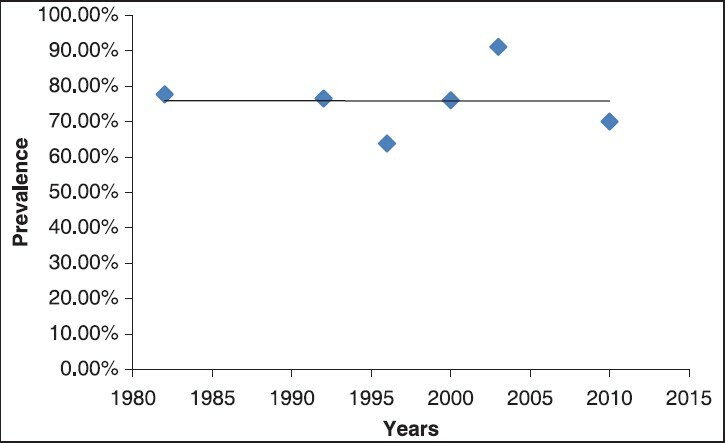 Highest caries prevalence (>90%) and greatest DMFT (>7) were observed in Riyadh and Qaseem in 2003, thus representing almost 65% increase in DMFT between 1982 and 2003. , However, caries prevalence and DMFT estimates reported by AlDosari et al. were 70% and 3.25 respectively in 2010. In a longitudinal study, Al-Shammery et al. showed an increase of 2.85 in DMFT score (baseline DMFT 1.95 and final DMFT 4.81) over a period of 3 years, and dental caries affected one tooth per child each year  [Table 2]. 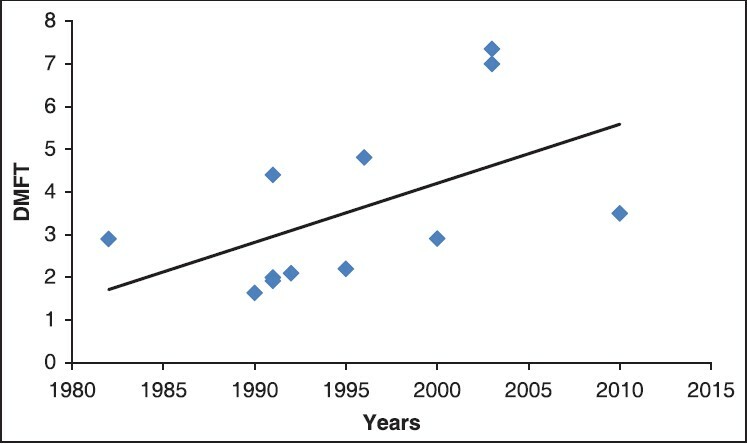 During the past three decades, there was an exponential increase in DMFT in children aged 12-19 years, however, the prevalence rates show comparatively fewer variations [Figure 3] and [Figure 4]. The special needs include a wide range of children that may have medical, physical, mental, and behavioral disabilities and require assistance. In a prospective study, Adenubi et al. observed caries prevalence of 79% in 1997 in Riyadh. A cross-sectional study of deaf, blind and mentally retarded children from Riyadh reported caries prevalence of 96.5% and dmft of 7.31 in children aged 6-7 years, while 11-12-year-old children had almost 92% caries prevalence estimate and 4.9 DMFT score in 2004. Murshid found caries prevalence of 65% and dmft of 3.1 and DMFT of 2.7 among autistic children in 2005 in Riyadh. Children with cleft lip and palate aged 1-6 years exhibited a high dmft of 10.54 in 2008 in Dammam. In 2009, Brown reported caries prevalence of 91.9% among medically compromised children aged 5 years in Riyadh  [Table 3]. In a cross-sectional study, Almas et al. observed caries prevalence of 68.5% and DMFT of 8.36 in 1993 in Riyadh that are the lowest caries estimates among selected studies on adults in the present review. Between 1996 and 2000, studies from different regions of KSA showed DMFT scores of 10 and 11. ,,, Even higher DMFT score (14.53) was observed in a study involving a sample of 297 school teachers in 2001 in Riyadh. 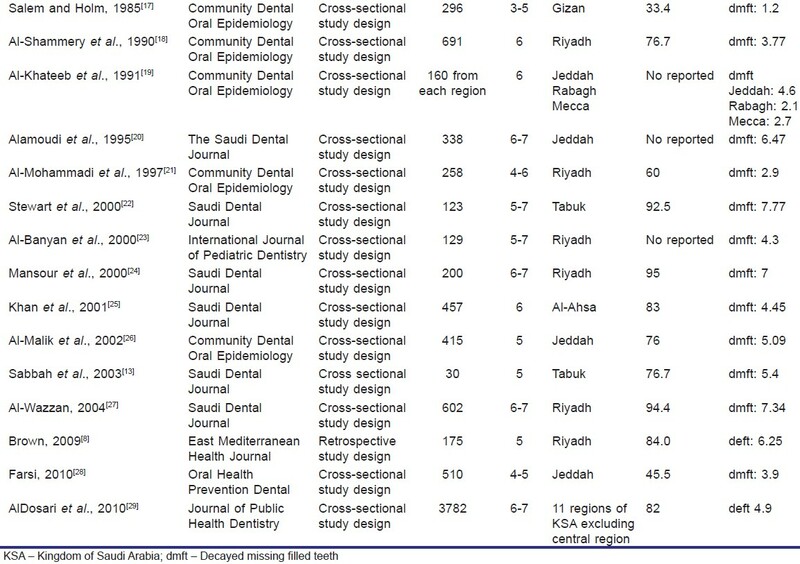 Similarly, a study conducted in 2005 reported caries prevalence of 89.2% and DMFT value of 13.24 in Al-Ahsa  [Table 4]. 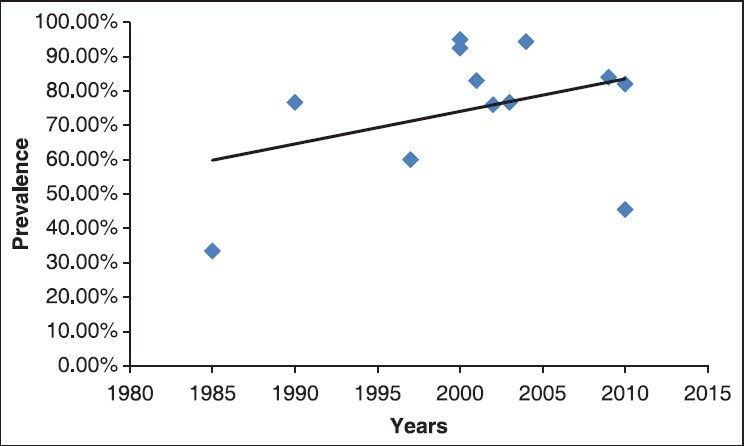 Secular trends indicate a dramatic increase in caries estimates among adults during the last decade [Figure 5]. Among older individuals, DMFT value of 24.3was observed in a cross-sectional study with a sample size of 540 subjects in 2005 in Riyadh. Similarly, another study revealed higher DMFT estimate (18.6) in elderly residing in residential homes in 2012 in Riyadh  [Table 5]. World Health Organization and World Dental Federation (FDI) established goals to achieve 50% of children aged 5-6 years to be caries free and global average of DMFT not to be >3 for 12-year-old children. However, even after 13 years, the proportion of caries free children is far less and DMFT score in 12-year-old children is much greater than WHO and FDI stated goals, which were to be achieved by 2000. Similarly, according to WHO's basic global indicator of oral health 2000, DMFT >6.6 for the children aged 12 years is considered very high, between 4.5-6.5 is high and 2.7-4.4 is moderate. Keeping WHO guidelines in mind, it can be clearly seen from the present review that children in Saudi Arabia have moderate to very high DMFT estimates. The situation is particularly alarming because high burden of caries not only can cause economic and social hazards but it can negatively affect growth, development and learning in the children. Data collected from the National Health and Nutrition Examination Survey (1999-2004) in the United States showed that about 28% of children (2-5 years) had caries in primary teeth while about 51% of children aged 6-11 years had caries in primary teeth, and 21% of them had caries in their permanent teeth. A cross-sectional study comprising a sample of 2,014 preschool Chinese children aged 3-5 years reported caries prevalence of 55% among them in 2007. Similarly, a study involving 1,487 children ages 0-5 years showed that 40% of preschoolers had caries in their primary teeth in 2007 in Southern Brazil. In 2002-2003, a nationwide health survey found that about 52% of 5-year-old children had dental caries, while 54% of 12 years and 63% of 15 years of adolescents showed dental caries in India. It is evident that caries prevalence appears much higher among Saudi compared with children from other countries. It is apparent from this review that most studies were performed in Riyadh city/region and only a limited number of studies were conducted in other regions just to name a few Jeddah, Mecca, Qassem, Tabuk, Al-Ahsa, and Dammam. Therefore, review is not representative of the populations in other regions in Saudi Arabia, and the findings of the review cannot be generalized to the other administrative regions of the country. The paucity of studies on dental caries from all geographical areas of the country involving all age groups is one of the weaknesses of the present research. Similarly, inclusion of studies involving smaller sample size, nonrandomization and subjects attending hospital or clinic threatens the validity of the current review. Moreover, almost all studies, except one longitudinal study on caries incidence and one retrospective study, included cross-sectional research design which has its own limitations as far as generalizability and interval validity are concerned. World Health Organization guidelines regarding age groups in oral health survey designs were not strictly followed due the possibility of losing important information from scarcely available data on caries, though attempts were made to stick to these recommendations as closely as possible. Different studies reported inconsistent estimates of prevalence of caries as well as dmft/DMFT values in similar age groups which are possibly because of different study subjects, different time periods of the studies, different geographical locations, difference in economic, social and cultural settings and personal hygiene practices. The wide variations of caries statistics even among same age groups and same geographic locations underline the need for better research planning for future population-based studies from all administrative regions of Saudi Arabia. Over the past few decades, the economic surge in Saudi Arabia has significantly changed life style approaches, which influenced oral health perceptions and behaviors of the people. In addition, population in Saudi Arabia exponentially increased by 13.16% between 2007 and 2010. , Tremendous growth in population coupled with dramatic societal changes, unhealthy oral health behaviors and practices, inadequate access to oral health care particularly in remote areas, nonavailability of fluoridated water and paucity of clinical and population-based research on the detrimental effect of caries can account for increased prevalence of caries in Saudi communities. As mentioned earlier, adults and elderly make up >60% of the total population in Saudi Arabia, nonetheless, there are very few studies available on them and most studies were conducted on children. Similarly, most studies were done on Saudi populations; however, expatriate children and adult populations make considerable proportions of the total population in the country thus necessitating epidemiological studies involving large sample size of such communities. The present data shows that various age groups in Saudi Arabia demonstrate a high prevalence and greater severity of caries, and secular trends also show a striking increase in DMFT and caries prevalence rates over the past few decades. However, preventive measures can be taken to considerably reduce the levels of dental caries in the country. The collaboration of caries prevention programs with national public health programs or other chronic disease programs is considered the most effective strategy. Reduction in the consumption of sugar containing foods, provision of community water fluoridation, school/community based topical fluoride application programs, availability of fluoride containing toothpastes and fluoridated dietary supplements, and oral health education and promotion are the most important caries preventive measures. Needless to say, the role of dental treatment or antimicrobial therapy remains extremely important in controlling dental caries. The author acknowledges Dr. Mohammad Ashraf Nazir, Lecturer, Department of Preventive Dental Science, College of Dentistry, University of Dammam for his role in reviewing the manuscript. Edelstein BL. The dental caries pandemic and disparities problem. BMC Oral Health 2006;6 Suppl 1:S2. World Health Organization. Oral health. Available from: http://www.who.int/mediacentre/factsheets/fs318/en/. [Last accessed on 2014 Jul 11]. Al-Ghannam NA, Khan NB, Al-Shammery AR, Wyne AH. Trends in dental caries and missing teeth in adults patients in Al-Ahsa, Saudi Arabia. Saudi Dent J 2005;17:57-62. Al-Sadhan SA. Dental caries prevalence among 12-14 year-old School children in Riyadh: A 14 year follow-up study of the Oral Health Survey of Saudi Arabia Phase I. Saudi Dent J 2006;18:2-7. Amin TT, Al-Abad BM. Oral hygiene practices, dental knowledge, dietary habits and their relation to caries among male primary school children in Al Hassa, Saudi Arabia. Int J Dent Hyg 2008;6:361-70. Zahrani AA. Dental health status among a sample of elderly dental patients in Riyadh, Saudi Arabia. Saudi Dent J 2005;17:74-82. Brown A. Caries prevalence and treatment needs of healthy and medically compromised children at a tertiary care institution in Saudi Arabia. East Mediterr Health J 2009;15:378-86. Alkarimi HA, Watt RG, Pikhart H, Jawadi AH, Sheiham A, Tsakos G. Impact of treating dental caries on schoolchildren's anthropometric, dental, satisfaction and appetite outcomes: A randomized controlled trial. BMC Public Health 2012;12:706. Shay K. Infectious complications of dental and periodontal diseases in the elderly population. Clin Infect Dis 2002;34:1215-23. Capelli D, Mobley CC. Prevention in Clinical Oral Health Care. 1 st ed. St. Louis: Mosby; 2008. Sabbah WA, Stewart BL, Owusu-Agyakwa GB. Prevalence and determinants of caries among 1-5 year-old Saudi children in Tabuk, Saudi Arabia. Saudi Dent J 2003;15:131-5. Sheiham A. Dental caries affects body weight, growth and quality of life in pre-school children. Br Dent J 2006;201:625-6. World Health Organization Press. Oral health survey basic methods. 5 th ed. World Health Organization, 2013. Available from: http://www.icd.org/content/publications/WHO-Oral-Health-Surveys-Basic-Methods-5th-Edition-2013.pdf. [Last accessed on 2014 Jul 11]. Salem GM, Holm SA. Dental caries in preschoolchildren in Gizan, Saudi Arabia. Community Dent Oral Epidemiol 1985;13:176. Al-Khateeb TL, al-Marsafi AI, O'Mullane DM. Caries prevalence and treatment need amongst children in an Arabian community. Community Dent Oral Epidemiol 1991;19:277-80. Alamoudi N, Salako N, Masoud I. Prevalence and distribution of caries in the primary dentition in a cosmopolitan Saudi population. Saudi Dent J 1995;7:24-8. Al-Mohammadi SM, Rugg-Gunn AJ, Butler TJ. Caries prevalence in boys aged 2, 4 and 6 years according to socio-economic status in Riyadh, Saudi Arabia. Community Dent Oral Epidemiol 1997;25:184-6. Stewart BL, Al Juhani TS, Al Akeel AS, Al Brikeet HA, Al Buhairan WH, Al Bundagji N, et al. Caries experience in grades 1 and 6 children attending elementary schools at King Abdul-aziz Military City, Tabuk, Saudi Arabia. Saudi Dent J 2000;12:140-8. Mansour M, Anwar S, Pine C. Comparison of caries in 6-7 year old Saudi girls attending public and armed forces schools in Riyadh, Saudi Arabia. Saudi Dent J 2000;12:33-6. Khan NB, Al Ghannam NA, Al Shammery AR, Wyne AH. Caries in primary school children: Prevalence, severity and pattern in Al-Ahsa, Saudi Arabia. Saudi Dent J 2001;13:71-4. Al-Malik MI, Holt RD, Bedi R. Erosion, caries and rampant caries in preschool children in Jeddah, Saudi Arabia. Community Dent Oral Epidemiol 2002;30:16-23. Al-Wazzan KA. Dental caries prevalence in 6-7 year-old school children in Riyadh region: A comparative study with the 1987 Oral Health Survey of Saudi Arabia Phase I. Saudi Dent J 2004;16:54-60. Farsi N. Developmental enamel defects and their association with dental caries in preschoolers in Jeddah, Saudi Arabia. Oral Health Prev Dent 2010;8:85-92. AlDosari AM, Akpata ES, Khan N. Associations among dental caries experience, fluorosis, and fluoride exposure from drinking water sources in Saudi Arabia. J Public Health Dent 2010;70:220-6. Younes SA, El-Angbawi MF. Dental caries prevalence in intermediate Saudi schoolchildren in Riyad. Community Dent Oral Epidemiol 1982;10:74-6. Akpata ES, al-Shammery AR, Saeed HI. Dental caries, sugar consumption and restorative dental care in 12-13-year-old children in Riyadh, Saudi Arabia. Community Dent Oral Epidemiol 1992;20:343-6. AlDosari AM, Wyne AH, Akpata ES, Khan NB. Caries prevalence among secondary school children in Riyadh and Qaseem. Saudi Dent J 2003;15:96-9. Al-Shammery AR, Akpata ES, Saeed HI, Khan N. Caries increment over a 3-year period in adolescent children in Riyadh, Saudi Arabia. Saudi Dent J 1996;8:68-73. University of Missouri College of Education. Parents of children with Special Needs. 2013. Available from: http://www.education.missouri.edu/orgs/parentlink/Parents%20of%20children%20with%20Special%20Needs.php. [Last accessed on 2014 Jul 13]. Adenubi JO, Saleem FH, Martirez JN. Dental health care at the disabled children's rehabilitation center in Riyadh. Saudi Dent J 1997;9:9-13. Al-Qahtani Z, Wyne AH. Caries experience and oral hygiene status of blind, deaf and mentally retarded female children in Riyadh, Saudi Arabia. Odontostomatol Trop 2004;27:37-40. Murshid EZ. Oral health status, dental needs, habits and behavioral attitude towards dental treatment of a group of autistic children in Riyadh, Saudi Arabia. Saudi Dent J 2005;17:132-9. Chohan AN, Wyne AH. Caries and oral hygiene status among a group of Saudi cleft lip and palate children. Pak Oral Dent J 2008;28:275-8. Almas K, Afzal M, Shakir ZF. Prevalence of dental caries in Al Qaseem region, Kingdom of Saudi Arabia. Pak Oral Dent J 1993;13:19-27. Almas K, Al-Jasser N. Prevalence of Dental caries and periodontal disease in a Saudi Population. Saudi Med J 1996;17:640-4. Al-Jasser N, Almas K. Ratio of molars DMFT with full mouth DMFT in a population from Saudi Arabia. Trop Dent J 1997;79:31-2. Ashri NY. Assessment of dental treatment needs among Saudi female patients in the dental school clinic, Riyadh. Saudi Dent J 1999;11:104-8. Khan N, Al-Shaafi M, Al-Garawi Z. Dental caries, fluorosis and knowledge of school teachers of Riyadh, Saudi Arabia. Pak Oral Dent J 2000;20:52-62. Al-Shehri SM. Oral health status of older people in residential homes in Saudi Arabia. Open J Stomatol 2012;2:307-13. World Health Organization. Oral health information systems. Available from: http://www.who.int/oral_health/action/information/surveillance/en/. [Last accessed on 2014 Jul 11]. World Health Organization. DMFT levels at 12 years 1996. Available from: http://apps.who.int/iris/bitstream/10665/61182/1/WHO_ORH_DMFT12_96.1.pdf?ua=1. [Last accessed on 2014 Jul 11]. Du M, Luo Y, Zeng X, Alkhatib N, Bedi R. Caries in preschool children and it's risk factor in 2 provinces in China. Quintessence Int 2007;38:143-51. Ferreira SH, Béria JU, Kramer PF, Feldens EG, Feldens CA. Dental caries in 0- to 5-year-old Brazilian children: Prevalence, severity, and associated factors. Int J Paediatr Dent 2007;17:289-96. National Oral Health Survey and Fluoride Mapping, 2002-03. An Epidemiological Study of Oral Health Problems and Estimation of Fluoride Levels in Drinking Water. New Delhi: Dental Council of India; 2004. Wang HY, Petersen PE, Bian JY, Zhang BX. The second national survey of oral health status of children and adults in China. Int Dent J 2002;52:283-90. Saudi Arabian Central Department of Statistics & Information. Demographic Research Bulletin 2007. Available from: http://www.cdsi.gov.sa/english/index.php?option=com_docman&task=cat_view&gid=43&Itemid=113. [Last accessed on 2014 Jul 11]. Saudi Arabian Central Department of Statistics & Information. Preliminary Results of General Population & Housing Census 1431 A.H (2010 A.D.) Available from: http://www.cdsi.gov.sa/yb46/Pages/MixFPage.htm. [Last accessed on 2014 Jul 11]. Petersen PE. Challenges to improvement of oral health in the 21 st century - the approach of the WHO Global Oral Health Programme. Int Dent J 2004;54:329-43.